Our doctors have over 67 years of combined chiropractic experience. Our staff includes two massage therapists, two insurance billing specialists, and four office assistants who are here to serve your needs and make your visit as pleasant as possible. 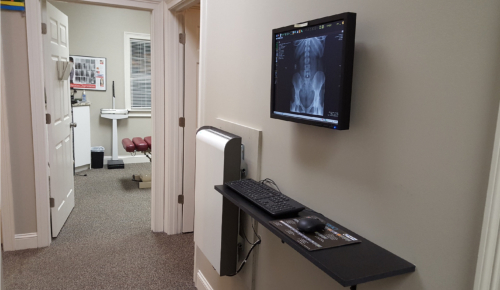 Our clinic has direct referral relationships with many area orthopedic doctors and general practitioners, including a medical doctor in the same building. If we cannot treat your case through chiropractic, we will be happy to refer you to the proper specialist. Chiropractic is a health care profession that focuses on disorders of the musculoskeletal system and the nervous system, and the effects of these disorders on general health. Chiropractic care is used most often to treat neuromusculoskeletal complaints, including but not limited to back pain, neck pain, pain in the joints of the arms or legs, and headaches. Doctors of Chiropractic practice a drug-free, hands-on approach to health care that includes patient examination, diagnosis and treatment. Chiropractors have broad diagnostic skills and are also trained to recommend therapeutic and rehabilitative exercises, as well as to provide nutritional, dietary and lifestyle counseling. We offer physiologic therapeutic procedures such as electric muscle stimulation, ultrasound, traction, heat and cold therapy. We schedule chiropractic services by appointment, but walk-ins are welcome and emergencies are always seen immediately. A 24-hour emergency number is available. Massage therapy can be a valuable additional treatment procedure for our patients. A massage can be scheduled with chiropractic treatment or independently for non-patients. We are conveniently located in the Towne Lake Family Chiropractic office suite at 1000 Wyngate Pkwy. Ste. 200 in Woodstock, Georgia. Your Towne Lake Family chiropractor can speak directly with your massage therapist to ensure that your care compliments your chiropractic treatment. We are pleased to offer your first massage at an Introductory Rate of $60. We offer frequent specials so be sure to ask your massage therapist or the front desk for current offers. Our staff of massage therapists is educated to national standards, licensed by the state of Georgia and Cherokee county, and provide excellent therapeutic massage services. Massages available Monday thru Saturday.